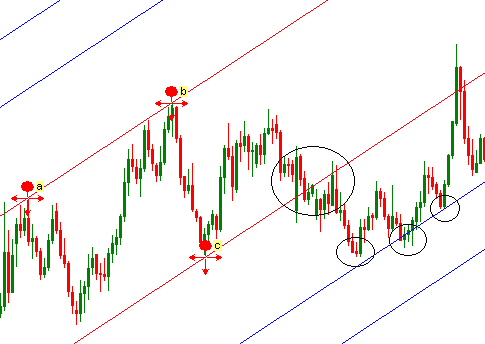 I have long time experience of trading with parallel trend lines or channels, but very recently I got introduced with the fibonacci channels and the trading techniques with the tool. Today I am going to share the trading technique with fibonacci channels. I drawn the fibonacci channels with great fibonacci lines analyzer tool. Let me explain the trading technique with fibonacci channels. As fibonacci expansion tool, we need three points or two waves to draw the fibonacci channels. The first point is at the beginning of the original wave, the second point is at the end of the original wave, and the third point is at the end of the wave that is retracing the original wave. But it is better, if the trend lines in the original fibonacci channel lie on more than one tops or bottoms. In the illustration below, I have drawn fibonacci channels to trade a bearish trend. The role of main channel is similar to the role of traditional channels in trading. So, the traders need to wait for the breakouts of the main channel. The lower trend line of the original channel represents support for a bearish trend ,and the upper trend line of the original channel represent resistance for a bullish trend. In the following illustration, fibonacci channels are drawn to measure a bullish trend. 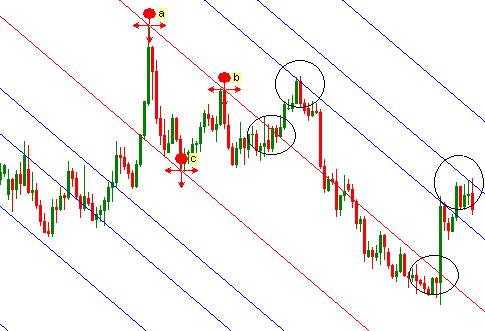 Fibonacci channels can be traded in different ways. Firstly, a long or short order can be placed when the breakout of the original channel appears. The take profit for the orders can be placed at the trend lines beyond the original channel. Here original channel is red in color. Secondly, the trend lines beyond the original channel can be traded as they represent strong support and resistance levels. In the above illustration, we can see that the trend lines represent strong support and resistance areas. To draw effective fibonacci channels, we need to remember that every trend lines in the original channel should be put on more than one tops or bottoms.The trend lines on single top or bottom cannot be considered as an effective trend line to compose an effective channel. Fibonacci channels can be a replacement of traditional channels. It is more effective than the traditional parallel trend lines because it also helps the traders in placing profit target. Traders, if you have any question regarding fibonacci trend lines, you can drop a comment below. You can also subscribe yourFXguide to receive updates. Hi, Do you know how to use time zone fibonacci? Your blog has an excellent content.